Each month we showcase the work of exceptional new artists. Typically these recordings are found on small independent labels. . . and often times are not found in mainstream distribution. So we will introduce you to them here. . . . We think that you will be pleasantly surprised by the talent we've discovered. 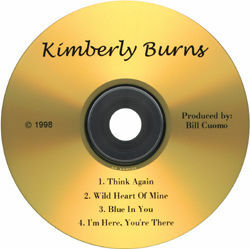 Kimberly Burns is a natural While It may be an overused term in the music business, In Kimberly's case it's a perfect description. Born to sing, her first eager audiences included family and friends, but she quickly made her way onto the stage to perform in school musicals and local concerts. In a sea of sound-alike would-be performers that flood the contemporary country music Industry, this young Northeastern native is the most refreshing entertainer to hit Music Row in a very long time. From a very early age Kimberly has been grabbing the attention of audiences, surprised to hear 'the big voice coming from such a little girl.' 'I can't remember when I first started to sing,' laughed Kimberly while taking a quick studio break during the recording of some of her new material. 'I guess the first words I said came out with a melody line.' By the age of five, Kimberly was playing the lead role in 'If I Were A King' for the local church, and she has not stopped singing since. Through her school years, Kimberly earned a. loyal following, whether playing for the local clubs with her band, or for the local Music Association. As her reputation as a talented entertainer grew, she and her band traveled through the Pennsylvania/Ohio area playing fairs, clubs and private parties where Kimberly continued to develop her own personal style of singing and fine-tuning her stage presence. After graduating from High School, Kimberly entered pre-law at Kent State University. When she was not studying, she was writing songs or performing with her band. 'It seems that my love for music won,' Kimberly remembers, concerning her decision to leave school and to follow her dream to try her own brand of country music on Music City. With nothing but her determination and her natural talent to woo Music Row, Kimberly quickly landed a job on the General Jackson (sternwheeler in Nashville, TN) where she became a favorite with the headline artists and audiences alike. Not one to wait for things to happen, Kimberly took the energy from this positive response, grabbed the bull by the horns and headed for Music Row. She immediately caught the attention of music executives and landed a job singing demos for Bone Cut Music. The life-long dream of recording her own music In Nashville is finally a reality. The results of the Cuomo/Burns collaboration are exciting and unique, since In Kimberly's words, I'm just doing what comes naturally! I'd like to thank my parents, Richard and Shirley Burns, my brother, Michael, Grandma Lucille Burns, for putting up with my late night singing through the years and for always supporting me. Rick Durrett, for believing in me when no one else did. Producer Bill Cuomo for his invaluable guidance and assistance, John and Judy, the milkman, the mailman, the checkout clerk at Walgreen's, Strobo, and all of my friends that helped make this project a reality. Thank you all very, very much. Directory of our 1995, 1996, 1997, 1998 featured recording artists.